After nine years of meticulous processing, Wilhelm Arntz’s collection of 20th-century art ephemera is ready to be explored. In 1984 the Getty Research Institute acquired the largest private 20th-century art library, amassed by the German art expert and independent researcher Wilhelm Arntz. Getty curators and librarians focused on cataloging the thousands of books and periodicals, wealth of study photographs, and extensive trove of unpublished documents to make them available to the public. 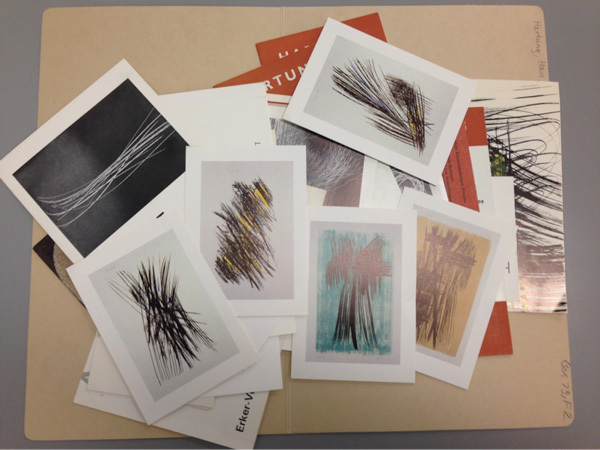 Ephemeral items, such as small exhibition catalogs, invitations to gallery openings, posters, flyers, and prospectuses for art publications, were set aside. Over the course of nine years—from 2005 until 2014—a small team of dedicated library staff devoted their spare time to organizing and cataloging approximately 100,000 of these ephemeral items. Today, all ephemera are arranged alphabetically by artist, gallery, museum, or art institution. Housed in 280 boxes, this immense collection is now available for research. See the finding aid here. The collection documents exhibitions, sales, and publishing of 20th-century art, predominantly in Europe (including many Eastern European countries) but also in the United States, Canada, Mexico, and South America. 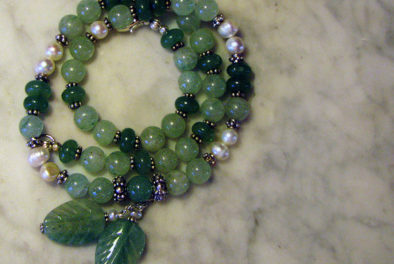 The material dates from the first years of the 20th century to the mid-1980s. These vintage publications often feature experimental typography and design. 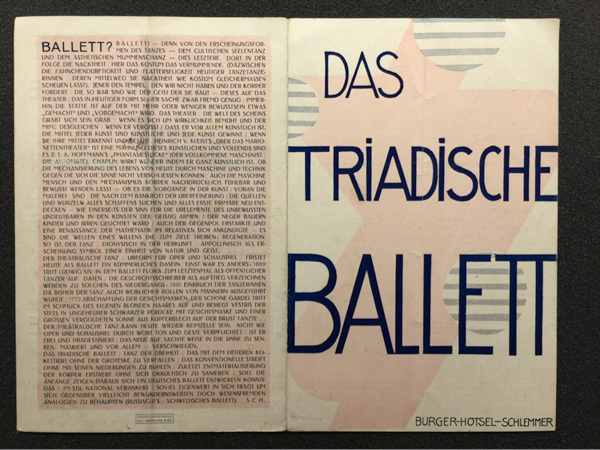 Take for example the program for the first performance of Oskar Schlemmer’s experimental theater The Triadic Ballet, which took place in 1922 in Stuttgart. 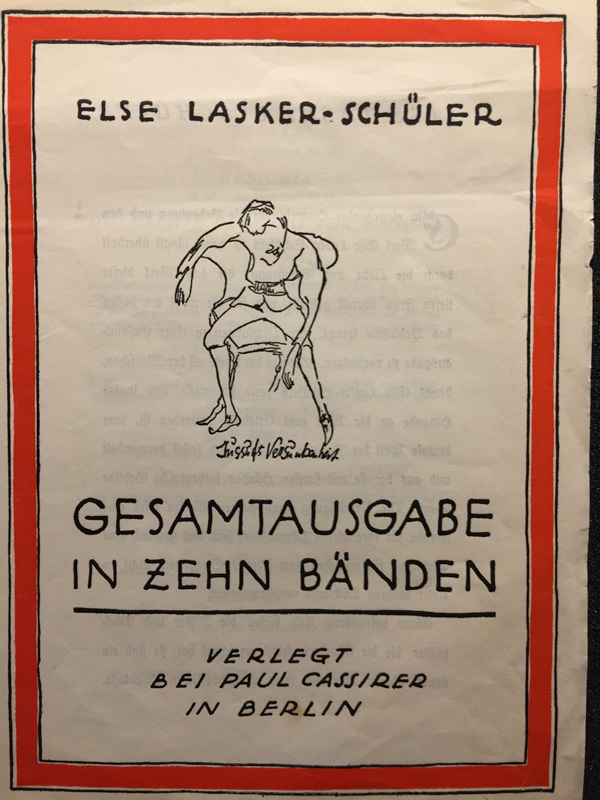 The prospectus for an edition of complete writings by the Jewish German poet and playwright Else Lasker-Schüler is similarly innovative in design. The ten-volume edition was initiated in 1919 by Paul Cassirer, a Berlin art dealer and publisher associated with the Expressionist movement. Lasker-Schüler made the drawing for the cover of the prospectus and designed the graphic layout. 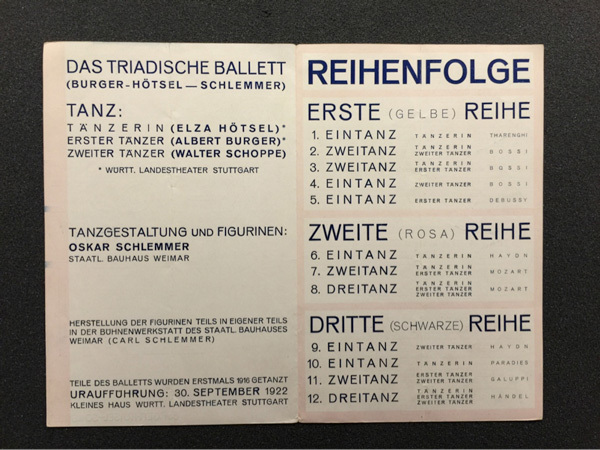 Other examples of experimental typography from the 1920s and ’30s are located in the files of Johannes Itten, a Swiss artist associated with the Bauhaus; Wassily Kandinsky, the Russian abstract artist and Bauhaus teacher; and the German painter Paula Modersohn-Becker. Arntz also collected advertisements produced by the leading art dealers and publishers of avant-garde art, such as Alfred Flechtheim, Fritz Gurlitt, and Wieland Herzfelde’s publishing house the Malik Verlag. 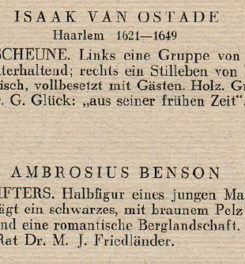 Part of his collection are approximately fifty small catalogs and leaflets of exhibitions held at the gallery Kunstsalon Ludwig Schames in Frankfurt am Main. Ludwig Schames was an advocate of several expressionist artists, especially Ernst Ludwig Kirchner. 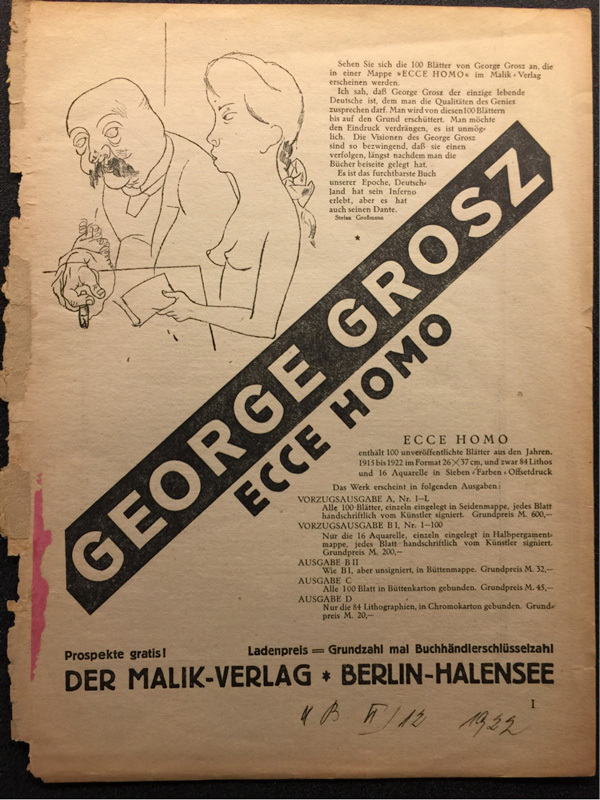 The Schames ephemera often feature annotations by various contemporary hands with prices and notes about the artworks for sale, providing a glimpse into the reception and sales of expressionist art before World War I.
Flyer advertising George Grosz’s portfolio Ecce Homo. The Getty Research Institute, Wilhelm Arntz collection of rare exhibition catalogs and printed ephemera, 2003.M.13, box 73, folder 38. The core of the ephemera collection is the myriad of catalogs and exhibition invitations issued by hundreds of primarily European galleries—established and lesser-known—operating after World War II. These postwar publications testify to the variety of artistic styles that took hold in the second half of 20th-century art, including abstract expressionism, tachism, magic realism, minimalism, action art, and pop art. Arntz collected ephemera on famous and influential artists as well as lesser-known artists around the world. The most extensive artist files are those of the prolific Pablo Picasso and Salvador Dali, and the pivotal Joseph Beuys and Andy Warhol. Among printmakers and illustrators, Horst Janssen and HAP Grieshaber are well documented. Thousands of small catalogs and prospectuses of exhibitions of less famous artists reveal the widespread influence of the more established artists and styles on contemporary art. Many artists who created intellectually stimulating and original art yet fell into obscurity are located in Arntz’s collection, waiting to be discovered by today’s researchers. 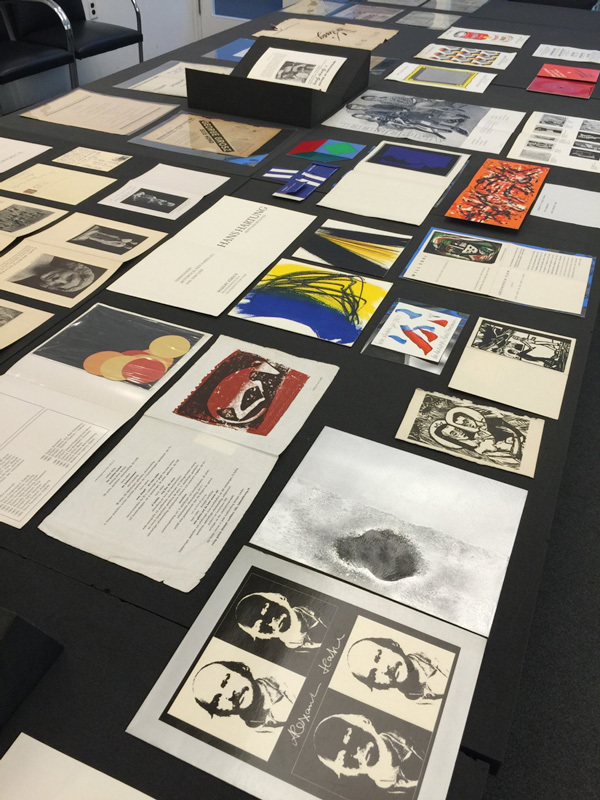 In addition to text-based materials, the collection includes original artworks. 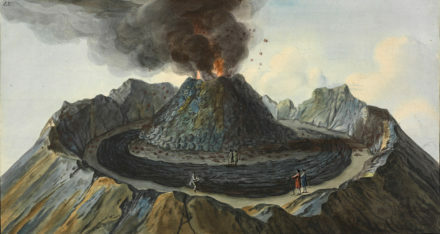 Some were made on the occasion of exhibitions, others were created as greetings or holiday cards. Such printed ephemera feature innovative typography and compositions, often in the style of the exhibited art. 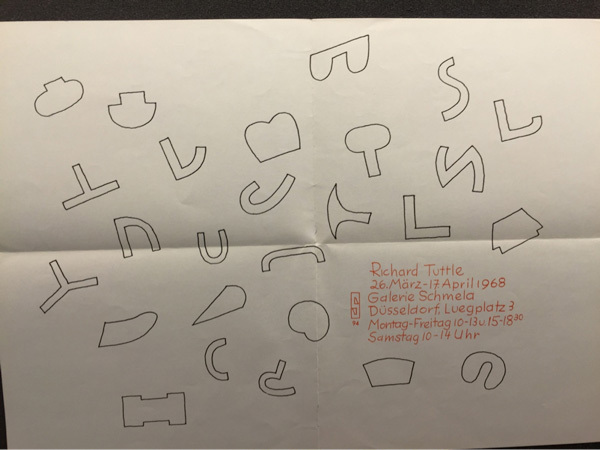 An exhibition invitation designed by the American postminimalist artist Richard Tuttle announces the show Cloth Pieces und Skulpturen, which took place at the Galerie Schmela in Düsseldorf in 1968. It was Tuttle’s first exhibition in Germany. Tuttle is just one of many postwar American artists who Arntz followed. Jasper Johns, Roy Lichtenstein, Alice Neel, Jackson Pollock, Mark Tobey, Andy Warhol, and Robert Whitman, along with many others, are amply documented. The collection also includes exhibition catalogs, sales catalogs, and other printed items issued by influential American art dealers, such as Betty Parson, Sidney Janis, Leo Castelli, and Irving Blum. The presence of “cutting-edge” American artists and art dealers in the ephemera collection testifies to Arntz’s awareness of the growing significance and influence of American art on European art in the second half of the 20th century. An example of such influence might be the self-portrait by the German artist Alexander Hatzl. Composed as a group of positive and negative images, Hatzl’s self-portrait seems to be inspired by Andy Warhol’s series of silk-screen portraits repeated in various colors and shades. Many of ephemeral materials mentioned here were likely conceived of as rather fleeting, short-lived documents. But thanks to Arntz’s foresight and diligent collecting, these 100,000 pieces collectively reveal many of the stories, trends, and personalities in art over the course of the 20th century.